Age-related macular degeneration (AMD) is the most common cause of irreversible vision loss in the western world among people over 60. The two forms of the disease — wet and dry — both cause vision loss by destroying cells in the central portion of the retina. In the last few years, progress in understanding AMD has been made thanks in part to the discovery of several common genetic variants, or SNPs, that together explain a large part of the risk for the disease. Several of the AMD SNP associations have pointed to a role for the immune system in the disease. Now two new reports of genetic associations, published this week in the Proceedings of the National Academy of Sciences, point to a role for another biological pathway in AMD: HDL-cholesterol level regulation. Two research groups, one led by scientists from Tufts University and the Massachusetts General Hospital (MGH) and the other led by researchers from the University Michigan, the University of Pennsylvania and the Mayo Clinic, each studied thousands of people with and without AMD. All study subjects had European ancestry. To increase their ability to find genetic variations associated with the disease, the researchers then shared their data and ran additional analyses. Several variations previously associated with levels of high-density lipoprotein (HDL) cholesterol, the so-called “good” cholesterol, showed some association with AMD risk in the combined analysis. The strongest signal was seen with a variant near the LIPC gene. Each copy of the less common T version of this SNP was associated with 0.82 times odds of AMD compared to people with two copies of the C version. The LIPC gene encodes the hepatic lipase enzyme, which is key to metabolism of HDL-cholesterol. “This LIPC locus may greatly enhance our biologic understanding by opening up another pathway for consideration in the pathogenesis of AMD. This finding could lead to insights regarding disease progression, ways to modify risk of AMD, and new treatments,” wrote the authors from Tufts/MGH. There has been previous speculation that cholesterol levels might play a role in AMD risk because cholesterol is a component of drusen, the deposits found in the retinas of people with the condition. However, there has not been any clear scientific evidence of whether there is a connection. Among studies in which a connection between cholesterol levels and AMD has been shown, there is disagreement about whether increased cholesterol levels increase or decrease AMD risk. Adding to the confusion is the fact that among the cholesterol-related genetic variations, there is no clear-cut direction of effect. For , the version of the SNP associated with decreased AMD risk has been associated with increased blood HDL levels. But for some of the other cholesterol-related SNPs with more modest associations that were identified in these studies, the association was in the opposite direction: the version associated with decreased AMD risk has been linked to lower HDL levels. “We suspect these genetic variations found in the cholesterol pathway impact the retina differently from the circulatory system, so cholesterol levels in the blood may not provide meaningful information about AMD risk,” said Michigan/Penn/Mayo study lead author Anand Swaroop in a press release. By combining their data, the two research groups also found evidence that a SNP near the TIMP3 and SYN3 genes is associated with AMD. Each copy of the less common G version of was associated with 0.62 times odds of the condition compared to people with two copies of the A version. 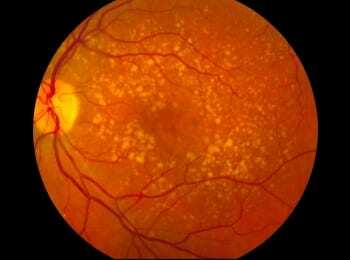 Mutations in TIMP3 have been shown to induce abnormal blood vessel growth, and the gene has previously been linked to Sorsby’s fundus dystrophy, a condition with many features in common with AMD. However, researchers had previously determined that TIMP3 was not linked to AMD. The newly published results may lead to a re-evaluation of this gene’s importance. The authors of the Michigan/Penn/Mayo study acknowledge that because the effects of the SNPs identified in the two new studies are small, and the versions associated with decreased risk are rare, neither variant may be that important for prediction of AMD risk in the general population. But they echo the sentiment of the authors of the Tufts/MGH study that this research may have identified a biological pathway–HDL cholesterol level regulation–that might be exploited for prevention or treatment. They note that for psoriasis, an effective treatment that targets the product of the IL23 gene has been developed, even though common variations in this gene have only a small effect on the overall risk for psoriasis. Note: Effect sizes of the variants taken from Neale et al., authors of the Tufts/MGH study.